50 Singers Of The Pre-Rock Era Try Their Hand At Rock 'n' Roll. In the early ‘50s, pop music was ruled by clean-cut singers making records for the whole family - romantic ballads, novelty songs, or hits from a musical. The fall of the big band era had made the singers the star, and the crooners ruled. Rock ‘n’ roll changed all that. The record industry was about survival of the fittest; the companies and their artists had to adapt or die, whatever they thought of the music. Hits were everything, and these fifty tracks show how the vocalists of the old guard on both sides of the Atlantic tried to get them by keeping up with the new craze. 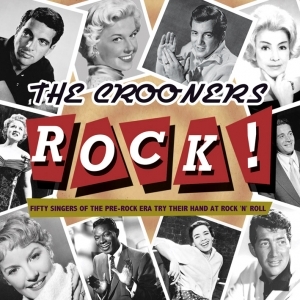 Some of the outings were enthusiastic but distinctly ill-advised and cringe-making; others proved that the crooners could rock, even if they didn’t really want to. Generally, neither their fans, nor the rock ‘n’ rollers, wanted to hear them do it, which meant that a high proportion of these tracks failed to chart, and were consigned to that highly collectable archive of rock ‘n’ roll curios, and are in many cases making their first outing on CD here. It’s a fascinating and entertaining insight into a strand of pop in one of music’s most exciting eras. 3 Jacques d’Iraque Sammy Davis Jr.